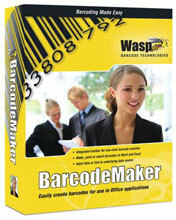 Wasp BarcodeMaker software lets you easily create high-quality barcodes for use in Microsoft Word and Excel. Designed for users without any previous experience with barcodes, BarcodeMaker allows you to create a barcode with the click of your mouse. Simply select the text for the barcode, and click on the integrated BarcodeMaker toolbar to instantly generate a barcode. Choose from 13 linear barcode symbologies, perfect for a range of applications including office and retail use, manufacturing, shipping, and asset management. The Wasp 633808105174 is also known as Wasp Bar Code	633808105174	.